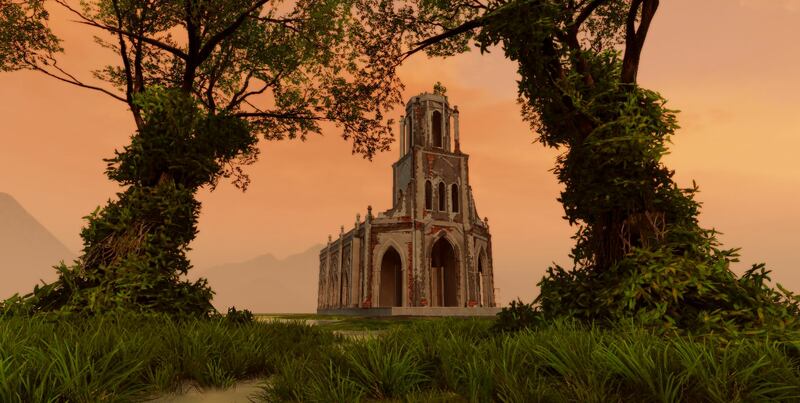 The ARVN 1st Division and local Viet Cong forces fight for control over the white sandy beaches of the Cua Viet along with its picturesque rice farms and villages, in northern Quang Tri Province. 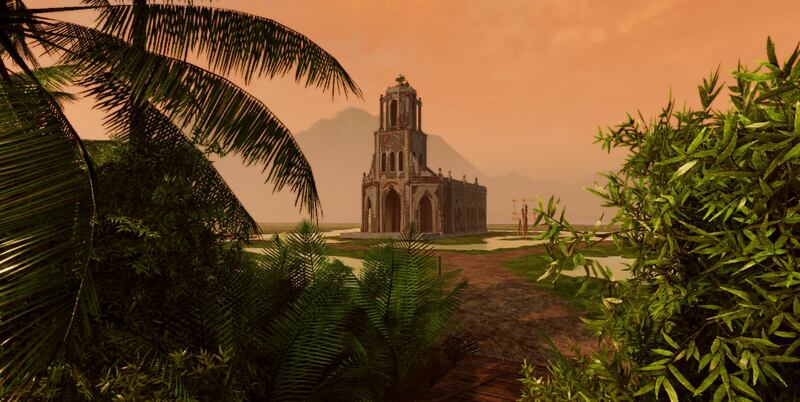 Players will find themselves in a large, immersive, painstakingly hand-crafted landscape that features new props and landmarks. In addition, there's a new gameplay feature that changes how Supremacy is played with teams now able to spawn on their most forward captured objectives, creating more tug-of-war battles and a feeling of progression as both teams fight their way through the map with the goal of encircling their enemy home base. For those interested, this is how the spawn system works for Supremacy in this map. The spawns are tied-in with the objective links, so your most furthest objective that is still connected to your Home Base will have a spawn attached. This spawn has a volume around it that will deactivate the spawn if an enemy troop enters, and the spawn will fallback to your second most furthest objective and so on. When the enemy leave the volume and you still control that objective it will reactivate the spawn again. This ensures that objectives are contested over in a fair way and not impossible to take. Each team still has a spawn at their Home Base which is activate throughout the whole game, just in case they need to defend it or they have no other spawn options. 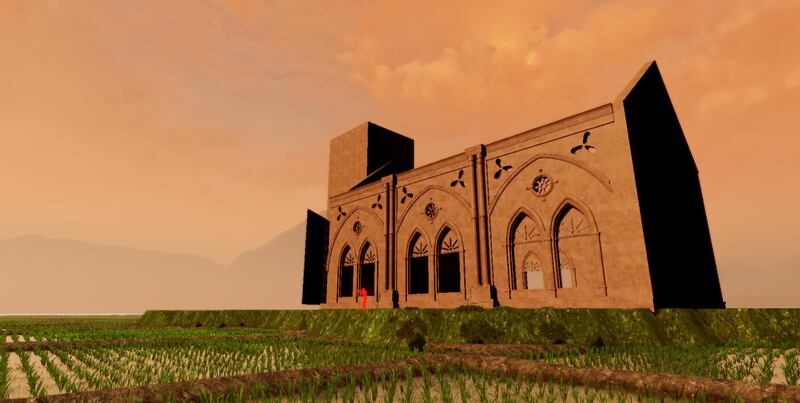 This is a back up spawn only to be used in certain circumstances while the forward spawns keep players in the action. Forward spawns are dangerous, and it's something players will have to learn to use wisely. They are susceptible to air and artillery attack just like squad leader or tunnel spawns. Last edited by PsychoPigeon; 03-09-2019, 01:31 PM. Looks cool. I see some custom assets. The spawn system should be interesting too. 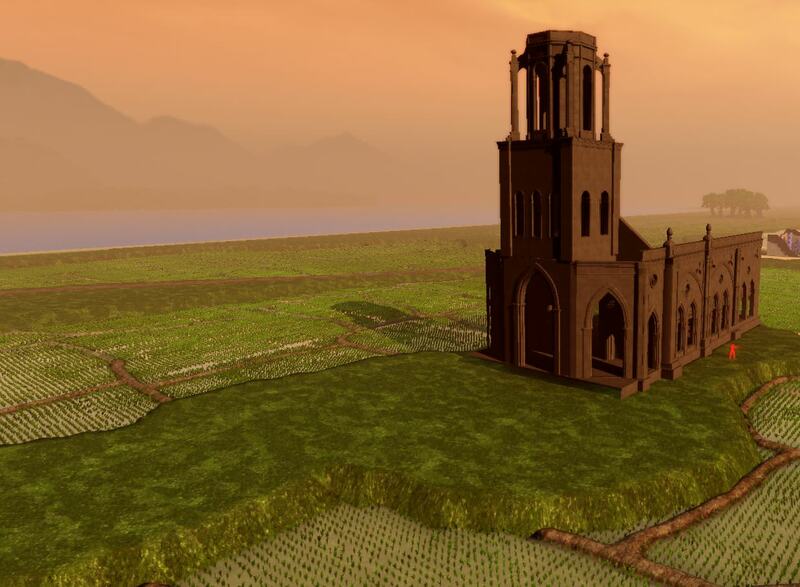 Yep - modelling a church as we speak. I made some small custom assets using existing textures, log piles, water well, fence, crouch-high rice walls for the fields and I'll probably model some low poly LST ships to have moored on the beach unloading supplies. As far as I remember RS1 had LST ships isnt it? Low poly as well. Yes, it did, however, they're solid colors rather than actual textures. Meaning they're generally used as silhouettes in fog. I imported the Rising Storm LST and it looks ok, I guess it would save me some work and I can get the map out quicker. 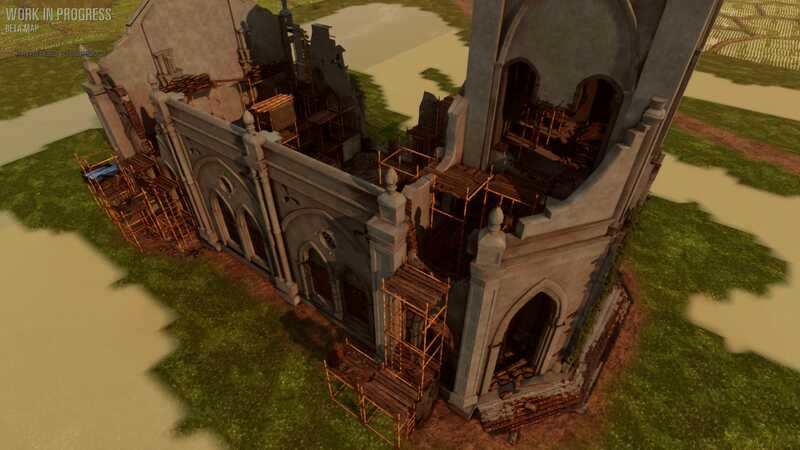 I've nearly finished the Church and I will post some screenshots over the weekend. 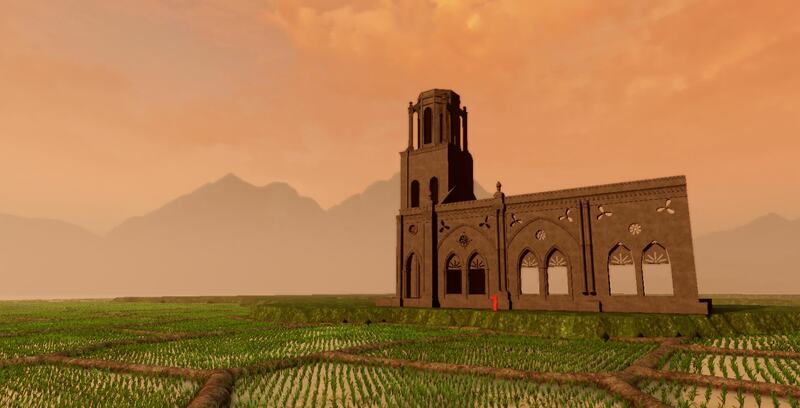 I made some progress with the church, the side walls are finished and what I have left to do is the back wall, and front area which also includes the church tower that players will be able to climb up into and use as a sniper position that overlooks the ricefields and villages. Should be a lot of fun shooting at helicopters flying past! 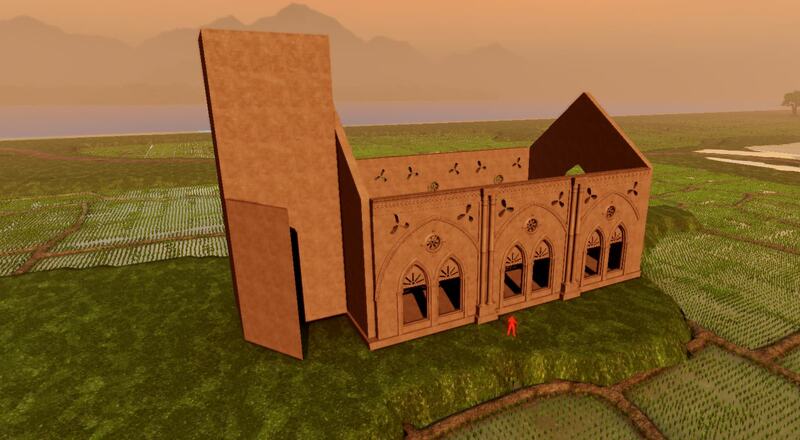 Another update on the church - I'm in the final stages now before I get to destroy it! 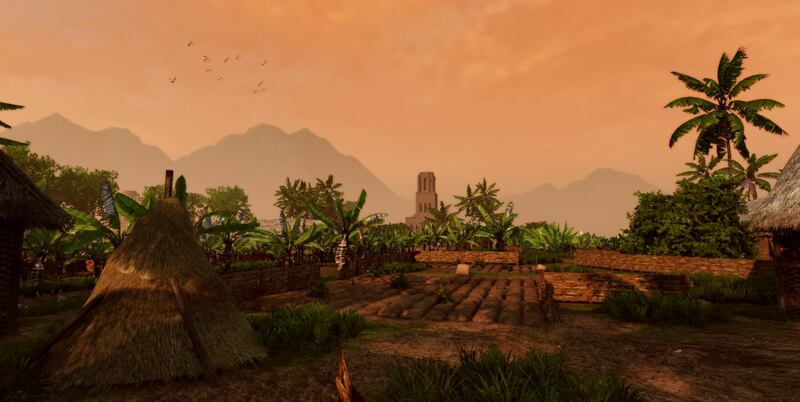 It took longer than expected to develop but it will add a lot to the map, and hopefully be a really fun Viet Cong homebase objective. Just about done with all the big stuff, few little additions like the floors inside the tower still left to do, after that I will destroy and dress the objective. I've broken the model up into chunks and started creating lightmaps, now I'm trying to iron out all the issues that brings. If you are planning on adding DSHK, would be lovely for it to have as much cover around it as possible without obscuring the vision, just so the shooter doesnt loose his head right away. Or perhaps if it has cover, it could use some blind spots for enemy infantry to sneak in. 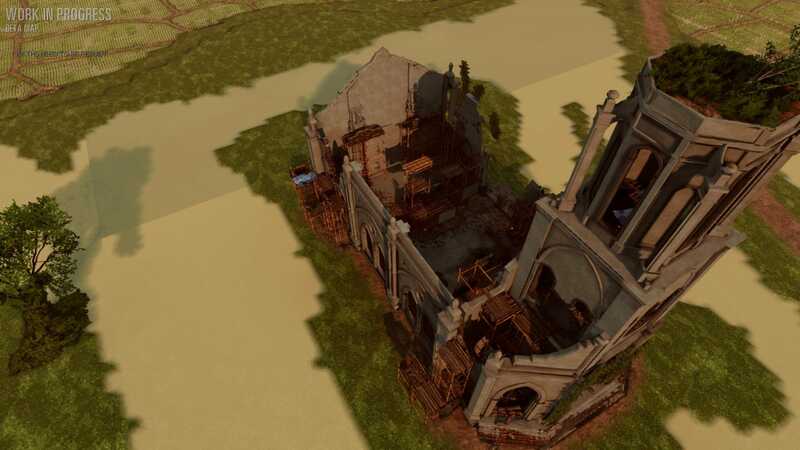 I've been away for a couple of weeks, I'm back now and have started on the damage pass on the Church objective, also adding gameplay and detail. This was definitely a larger task than I thought it would be but it's good modelling practice. 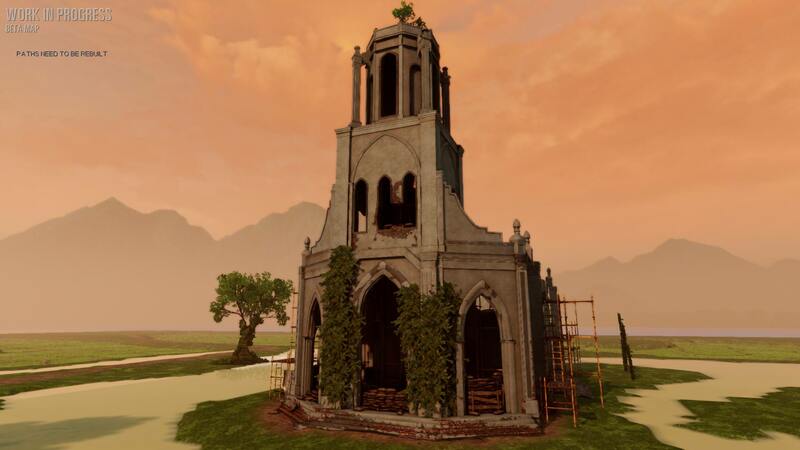 The front of the Church, the middle floor houses a DShk, and there's a ladder taking players to the top of the tower which makes for a great sniping spot. The entrance is barricaded so the VC can put up a strong defense. 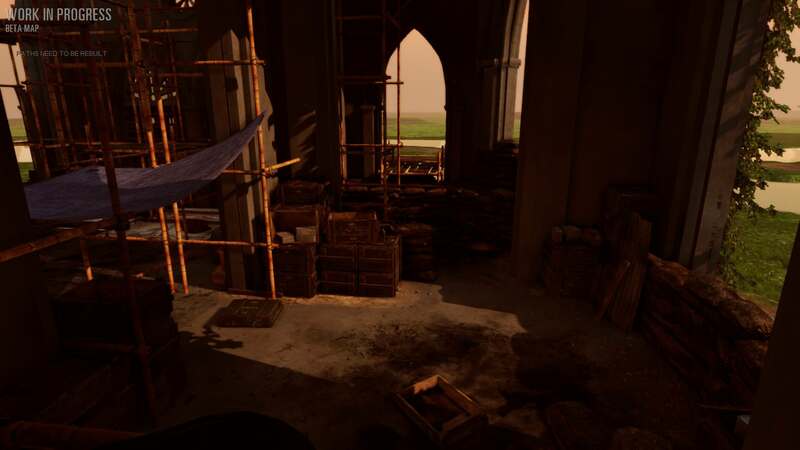 Attackers will have to overcome the barricades or use the scaffolding to get inside the Church. Several routes into the objective and to the tower, since the map is quite flat this objective offers some very good height variation. 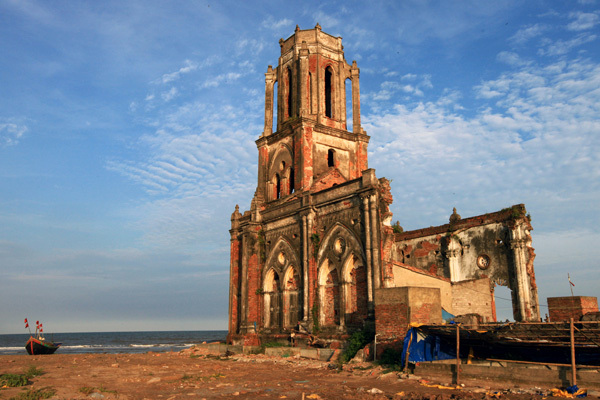 The interior of the Church is full of abandoned construction material left over from efforts to rebuild.